Social service non-profit organisations (SSNPOs) have changed significantly since the introduction of ‘new public management' (NPM). The need to adapt strategic management methods appropriate to non- profit activities has become a priority. 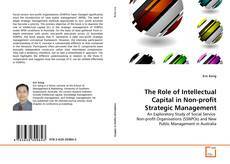 The primary objective of the book is to examine the role of intellectual capital (IC) in the strategic management of SSNPOs under NPM conditions in Australia. On the basis of data gathered from in- depth interviews with senior non-profit executives across 22 Australian SSNPOs, the book argues that IC represents a valid non-profit strategic management conceptual framework. However, the interview participants' understanding of the IC concept is substantially different to that contained in the literature. Participants often perceived that the IC components were mutually independent constructs rather than interrelated components. They had a tendency, therefore, not to take a streamlined IC approach. The book highlights the different understanding in relation to the three IC components and suggests how the concept of IC can be utilised effectively in SSNPOs.